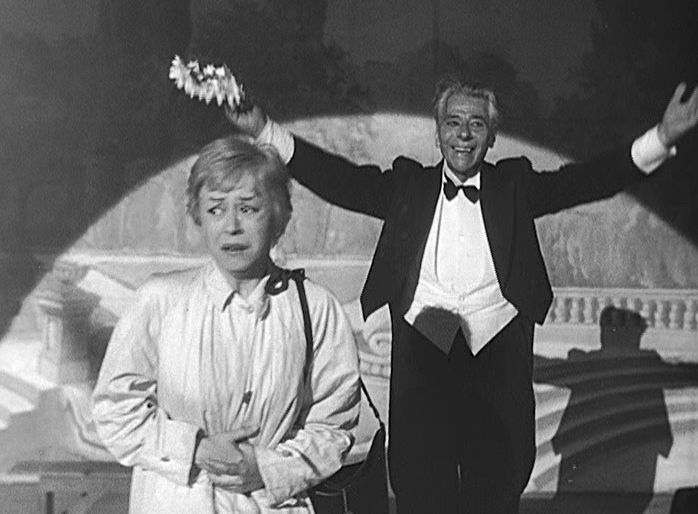 Nights of Cabiria (Le Notti di Cabiria, 1957) was one of Federico Fellini’s most popular films. It won the 1957 US Academy Award for Best Foreign Language Film, which was Fellini’s second straight Oscar in that category, since his La Strada had also won that award in 1956. Nights of Cabiria also earned its star (and Fellini’s wife), Giulietta Masina, the 1957 Cannes Film Festival award for Best Actress. 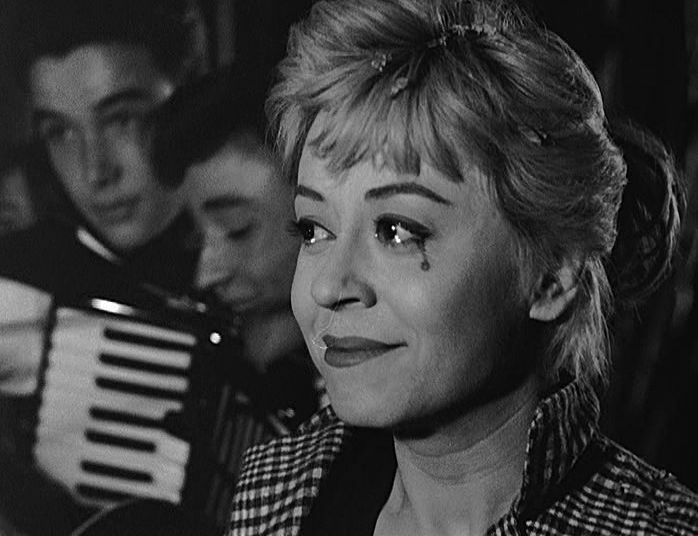 This was a period in which Fellini achieved great heights of human expressiveness, and Nights of Cabiria is considered to be the third installment of what is referred to as Fellini’s “Trilogy of Loneliness”, with La Strada (1954) and Il Bidone (1955) making up the other members of the trilogy. Indeed loneliness is the key thematic issue in Nights of Cabiria, which tells the story of a prostitute’s struggles to find happiness in her very much compromised world. 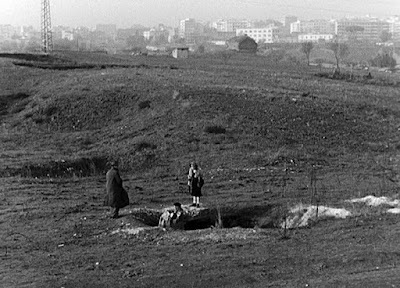 This makes the film considerably removed from Italian Neorealism, in which tradition Fellini began his career. Because of that earlier tradition and because the film is shot in run-down urban locations, some critics have argued that Nights of Cabiria really has a political message that concerns social themes such as class, prostitution, and religious exploitation . But those items are only a social backdrop for Fellini’s more profound exploration of the universal search for totally romantic fulfillment. 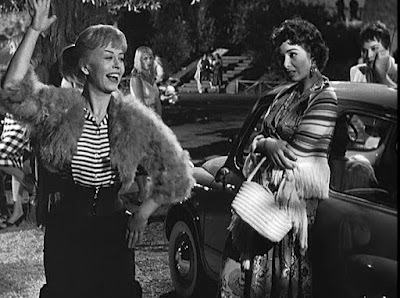 Although the loneliness theme does link Nights of Cabiria with Fellini’s two previous films of the trilogy, there are interesting narrative similarities between Nights of Cabiria and Fellini’s subsequent outing, La Dolce Vita (1960) . Those two films both present a sequence of expressionistic episodes, each of which provides a distinct thematic context for the frustrated protagonist’s quest for fulfillment. But while the quest in La Dolce Vita concerns general meaningful fulfillment in life, the quest in Nights of Cabiria is true love. And the memorable endings of those two films leave the viewer with distinctly different feelings about future prospects for the respective protagonists, too. The story of Nights of Cabiria comprises five episodes in the life of its protagonist, the prostitute Cabiria Ceccarelli (Giulietta Masina). Each of these episodes represent stages in the inner development of Cabiria’s plucky character. Although each one ends in disappointment, she alwalys emerges with renewed resolve. 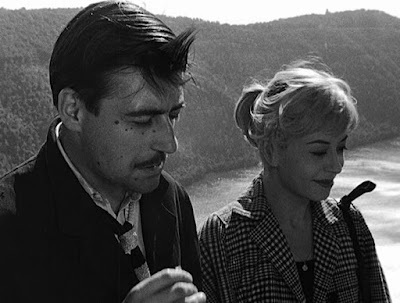 The film opens with a 1-minute long shot of Cabiria with her boyfriend Giorgio lovingly cavorting by the river bank. It is obvious that Cabiria, at least, is hopelessly in love. As Cabiria is standing by the bank’s edge, Giorgio pushes her into the swiftly moving water and runs off with her purse. Since Cabiria cannot swim, she very nearly drowns; but some young boys nearby heroically rescue her, and then a couple of men who rush to the scene revive her with artificial respiration. The flustered Cabiria is in no mood to thank her rescuers, however, and she angrily storms off and heads home to her one-room house. It is only at this point that we learn that Cabiria is a prostitute and also, perhaps because of the kind of life her profession entails, that personal dignity is something very important to her. She was madly in love with Giorgio and cannot believe it when her neighbor and fellow prostitute Wanda (Franca Marzi) gently tells her that Giorgio just wanted to steal the 40,000 lira (~US$140) in her purse. From our brief exposure to Giorgio, it seems that he is nothing but a selfish exploiter and hardly worthy of Cabiria’s devotion. So the main theme of this episode is Cabiria’s romantic innocence and vulnerability. But at the same time she is clearly feisty and ready to mix it up with anyone who troubles her. In the second act we are introduced to Cabiria’s raucous streetwalking milieu. This crowd is not an upscale group of prostitutes, but more pf a motley crew that collects in a more plebeian area near the Passeggiata Archeologica. While waiting for customers, there is a lot of strutting and taunting among the girls and their pimps, and Cabiria is one of the energetic participants. After a friendly pimp ushers Cabiria away from a brawl she had with another prostitute, he drops her off in the glitzy Via Veneto area. But Cabiria doesn't find any customers that evening and eventually walks by a nightclub, where she sees a famous movie actor, Alberto Lazzari (Amedeo Nazzari) in a heated spat with his glamorous girlfriend Jessy (Dorian Gray). After Jessy storms off, Lazzari on impulse summons Cabiria to be his partner for the rest of the evening. Cabiria is wowed by the upper-class extravagance of Lazzari’s world, and she accompanies him to his luxurious mansion. But just as things are warming up between Lazzari and Cabiria, Jessy returns to the scene, and Cabiria is forced to hide away for the rest of the night in the bathroom. The focus of this episode has been on the star-struck Cabiria’s brief explore to a level of wealth and glamour that she could only dream about. In the morning she drearily walks home and back to her own sordid life. Back with the prostitutes again, a passing religious procession prompts a discussion about religion and the possibility of miracles. They all consider going to a church where an alleged historical sighting of the Virgin Mary makes it a place for the faithful to pray for miracles. Cabiria considers it, but is ambivalent, since she is also practical about her living. When a truck stops by and invites her, she readily climbs in for her next job. Afterwards, she is dropped off in the city outskirts and happens upon a quiet and selfless samaritan who is busy distributing food to the homeless who sleep in cave holes on the city’s outskirts. Cabiria is amazed that the man apparently acts entirely on his own to help people in distress and seeks no reward or recognition. 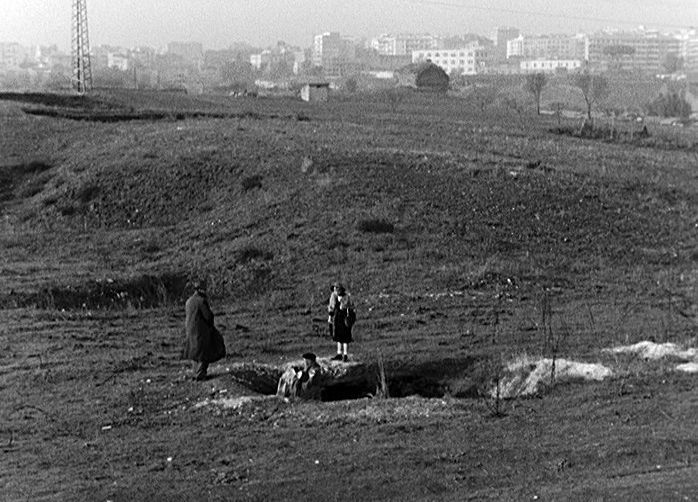 This scene with the samaritan, whom critics sometimes refer to as “the man with the sack”, was cut from the original release of the film (after its showing at Cannes) apparently on orders from the Italian Roman Catholic Church, and it was only restored to distributed prints in 1998 . This scene is important to the film’s meaning, though, because it summons up in Cabiria a fleeting awareness of her own true inner essence. Later Cabiria joins the other prostitutes to visit the Holy Madonna church where they can petition the Virgin Mary for a miraculous gift. The scene shows masses of greedy supplicants almost storming the church in hopes of some potential miraculous material gains. In the church Cabiria humbly prays that she can change her life to the good, but she is appalled by the selfishness she sees around her. Afterwards she gloomily realizes that they are all just the same as before and the efficacy of the Church and its prayers is basically zero. 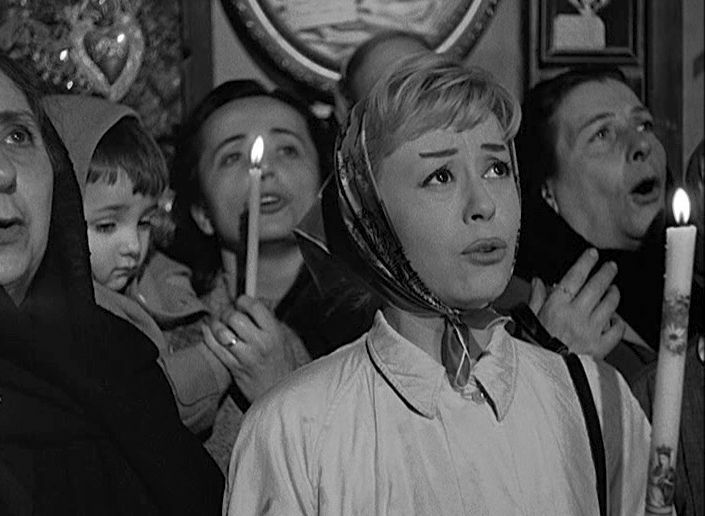 So this episode’s focus on the emptiness of the religious life, which was more or less mirrored in Fellini’s subsequent film, La Dolce Vita, compounds the gloom of the previous episode’s focus on the unattainability of the glamorous life. Walking later in seedy area, Cabiria drops in on a magic show, where she is lured into going up on stage to be hypnotized. She is immediately put into a trance where she is made to believe that she is the innocent, romantic young girl she once was. In a dreamy state, she dances around the stage pretending to be arm-in-arm with her dream lover, a conjured up persona that the magician calls “Oscar”. When she comes out of her trance, she is humiliated to see the raucous crowd of men laughing at her silly naivete. Again, though, we have seen that deep inside Cabiria’s naughty hard-boiled exterior there lurks a longing for true love. 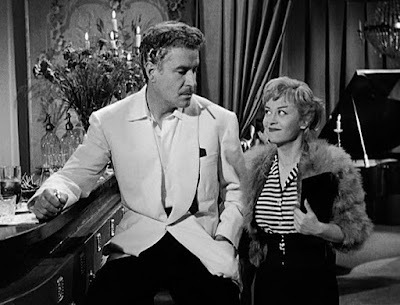 Coming out of the magic show theater, Cabiria meets a man calling himself "Oscar D'Onofrio" (François Périer) who had watched her up on stage and now wants to become her friend. This final and by far longest episode concerns their slowly emerging relationship. Cabiria is skeptical, but Oscar appears sincere and civilized; he asks nothing of her but her company. He makes no sexual demands, and they don’t even kiss until relatively late in the piece. Certainly he is the man she has always been looking for. Yes, that is what matter’s: one’s inner self. She is ready to take the plunge. But as we were forewarned by episode #1, things don’t turn out as Cabiria hoped. There are several things that contribute to the film’s expressive effectiveness. 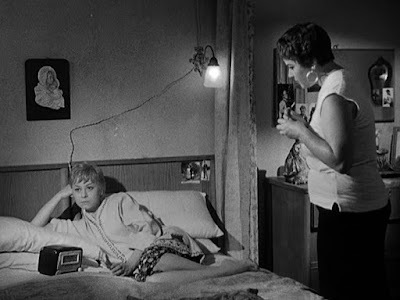 First of all there is the music of Nino Rota, whose romantic tunes resonate throughout the narrative, sometimes in the background but often from diegetic sources in the story. Even more significantly, there is the odd but effective combination of Fellini’s realistic settings that are combined with his emotive expressionism. This expressionism is partly conveyed through the highly demonstrative acting, particularly that of Giulietta Masina (Cabiria). Fellini devotes the whole film to exploring her conflicted character, and this presentation is considerably enhanced by Franca Marzi’s portrayal of Wanda, through whose worried countenance we see further into Cabiria’s vulnerability. It is true that Masina’s relentless flow of smirks, frowns, and dramatic postures has been criticized for reverting to silent-screen overacting, even self-consciously mimicking Charlie Chaplin. But there are real personalities in this world who are naturally like this, and Masina’s performance is convincing and ultimately moving. Her performance here was probably her crowning achievement. In any case the comparison with silent movies is apt, because Fellini’s expressiveness enables the viewer to understand the film purely from the visual plane alone and without any reference to sound. He had the ability to tell his stories purely visually. Indeed European films, in those days were intended to be distributed in multiple language formats and were shot without synchronous sound (MOS). All the sound was dubbed in later, even for the original language. Under these MOS circumstances, Fellini apparently often had Nino Rota’s music playing in the background while shooting in order to put his actors in the appropriate mood. Sergio Leone did the same thing with Ennio Morricone’s music for his spaghetti westerns. Of course the sound does make an important contribution, too, and when I watch a foreign language film, I usually prefer to see it with its original-language soundtrack and with subtitles, rather than seeing a dubbed-in-English version. But with Fellini’s films from this period, all versions are dubbed, and the English-dubbed version is just as “original” as the Italian-dubbed version. However you see it, though, I think you will get the feeling that Cabiria’s personal narrative journey, which shows her getting buffeted wherever she looks, does not end in despair. Her ever-hopeful romantic vitality lives on. Gary Morris, “Pre-‘Felliniesque’: Fellini’s The Nights of Cabiria”, Bright Lights Film Journal, (1 September 1998). Roger Ebert, “Nights of Cabiria”, Rogerebert.com, (16 August 1998). Jonathan Rosenbaum, “Restored to Power [NIGHTS OF CABIRIA]”, JonathanRosenbaum.net, (21 August 21 1998). Federico Fellini, "Nights of Cabiria”, The Criterion Collection, (6 September 1999). While talking about this film people so often forget about Pier Paolo Pasolini's contribution. Yes, Pasolini collaborated on the screenplay, providing Roman street dialogue.